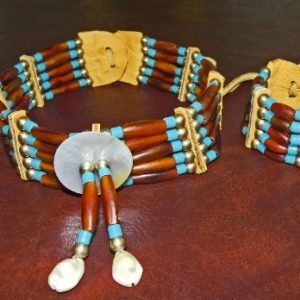 This single 5 row chokers is made of white & blue dyed bone hair pipes with nickel metal round breads on white buckskin leather & features a silver & abalone turtle pendant. The spacers & tabs are hand cut from soft, white buckskin which is very comfortable to wear without the scratching & irritation of common hard leather spacers. See the new 40 row matching breastplate HERE. 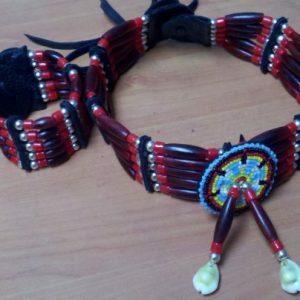 This choker is made by artist Gary ‘Redwing’ Hunt. Gary is not an enrolled tribal member of the Cherokee or Sioux nations, but is descendant of each. 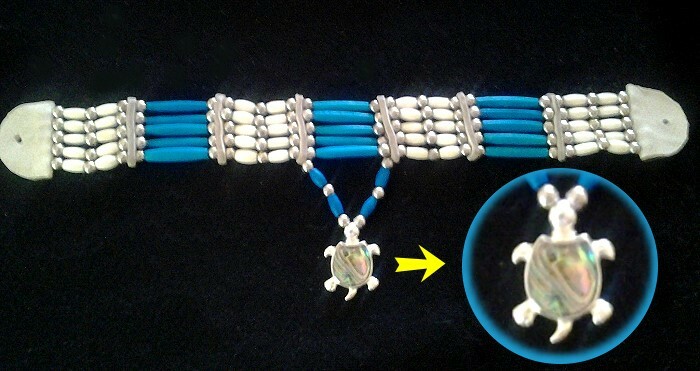 Therefore, no legal claim of Native American authenticity may be claimed. 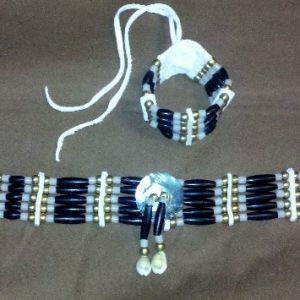 But his native spirit is evident in the quality & style of his work.